One of the greatest –if not the greatest –credit card benefits is the 4th Night Free perk exclusively with the Citi Prestige® Card. Today we’ll do a deep dive into what it is and how to use it. What is the 4th Night Free? In short, this benefit allows you to book a four-night hotel stay and receive the average room rate back as a statement credit. This was tweaked recently as the rebate used to be the cost of the last night (hence, the 4th Night Free name), but now it’s the average nightly rate. While the Prestige and other cards offer annual travel credits or an annual free night with restrictions, no other credit card offers anything close to this. Hotel chains routinely offer limited-time deals or specials to earn a free night, but your options could be confined to certain hotels or there could be blackout dates. However, the Prestige’s 4th Night Free benefit can be used at practically any hotel, hostel or resort worldwide with a few limitations and exclusions. Like everything these days, there are terms and conditions to getting the free night. Your hotel stay must be booked through Citi as other bookings made directly with the hotel or other outlets are not eligible. Not every hotel is available. The general rule is that the property must be bookable online using a public offer without the need for a credit card authorization form. AAA rates, corporate rates, government rates, hotel discount codes, and other membership rates are included. You just need to tell the Citi Concierge where you found that rate and provide any applicable code. Taxes and fees are not included as part of the rebate. The 4th Night Free rebate only covers the cost of the room, but you can still save a lot of money. If you book a block of rooms, only one room will receive the 4th Night Free rebate. Hotels booked as part of packages aren’t eligible. Some all-inclusive properties don’t qualify. If your chosen property offers non-all-inclusive rates, the price you can book with Prestige free night will only cover the average cost of that rate, so you’ll have to pay for your meal separately. But if the all-inclusive you want only offers all-in rates, you’re covered! Free nights can’t be combined with back-to-back bookings. Only one night will be comped if you book a stay longer than four nights. That being said, if you and another person in your party both have the card, you could book one stay for four nights under your name, then your companion could book a separate 4-night stay under their name. Another way around this rule is if you change hotels during your stay. You could book four nights at Hotel A then four nights at Hotel B. Since these are separate bookings at different properties, you’ll get one free night at A and one at B. There are three ways to book: by phone, email, or online. Online is easiest at thankyou.com where you search and book just like you would on any hotel website or OTA. However, if you go this route, certain membership rates or deals may not always show up. An alternative is to call 561-922-0158 and complete the reservation with a live person. This is the more time-consuming method, but you can book exactly what you want. Lastly, you can email concierge@yourconciergecenter.com with your name, last four digits of your Prestige card, dates, hotel, loyalty number and details of the rate. Regardless of how you book, if you prepay, you’ll receive the rebate automatically. If you are paying later at the hotel, you’ll need to use your Prestige, then after doing so, the rebate will be applied a few days after your completed stay. Can I Get the 4th Night Free and Redeem Points? Yes, if you’re using your Citi ThankYou points, you’ll redeem them at a rate of one cent each toward the cost of the discounted hotel stay. For example, let’s say you’re staying at a hotel with an average nightly rate of $100. That $400 hotel bill now costs just $300, and you’d only need to redeem 30,000 points to pay for your stay. Keep in mind that you can redeem ThankYou points toward other hotel or airfare redemptions at a rate of 1.25 cents each. Or, you can potentially get much more value with your points by transferring them to air and hotel partners and booking awards with said partner. If you choose to stay at a chain hotel, be sure to give the Citi Concierge your loyalty number, and you’ll still earn points and receive elite benefits. This is huge because typically when you book through other online travel agencies (OTAs), you don’t earn points, elite credits or have your elite benefits applied during your stay. Because this benefit has the potential to be extremely lucrative, keeping the card year after year and continuing to pay the annual fee is a no-brainer even if you only travel a few times a year. Let’s do a simple breakdown of the annual fee, and for the sake of this assumption, I’ll only take into consideration the hard dollar figures beyond the first year you have the card and exclude the value of the points earned, lounge access and other benefits since those aren’t easily quantifiable. I’ll also exclude the Global Entry credit since that benefit can be found on multiple other cards and is not one you can utilize every year. $450 is the standard annual fee. Let’s assume you complete a single 4-night stay once per year, and the average nightly rate is $200. 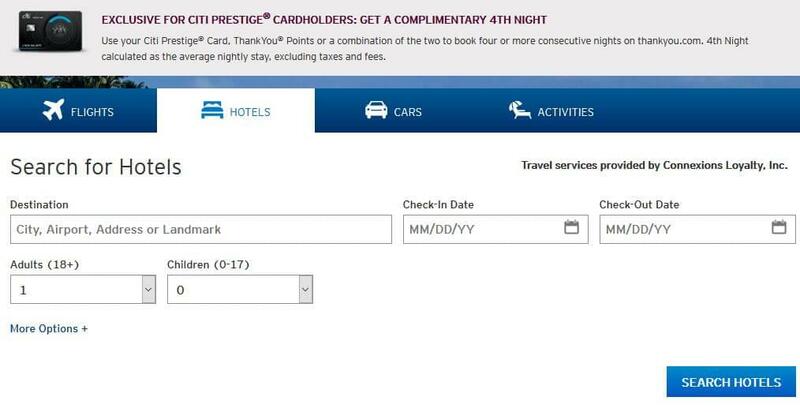 Using the Prestige 4th Night Free benefit, you save $200 and have paid for the remaining cost of the card. Additionally, if your average nightly rate is over $200 or you complete multiple 4-night hotel stays each year, you’ll get more than the annual fee’s cost out of the 4th night free. The 4th Night Free Benefit on the Citi Prestige is truly amazing and can save you a ton of money. If you don’t already have the Citi Prestige in your wallet but stay in hotels at least four nights at a time, you shoul seriously consider getting this card.